SAN DIEGO, CA--(Marketwire - January 21, 2011) - While Russia is known for its vodka, many of the world's most popular brands do not call Russia home. Whether at a nightclub or at the latest lounge, modern vodka favorites like Vox, Ketel One, Belvedere and Grey Goose have quickly become essentials. Check out this list of the world's favorite vodkas, valued for their taste rather than their price point. It's true that people love a great escape, but the Hollywood Hills aren't usually seducing executives when it comes to typical tourist attractions. This month's business profile looks at the unusual suspects of Los Angeles' famed frame, from an infamous hotel on Sunset Blvd. to the ultimate shopping specials in Beverly Hills. It wouldn't be a proper introduction to 2011 without profiling some celebrities who have taken their brand to a whole new level. 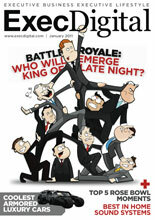 In this month's celebrity execs, Exec Digital delves into 2010's most controversial talk show host -- the late night king. From Conan to Jay, who emerges at the top? Find out, by reading the rest of this story and the rest of January's Exec Digital. Exec Digital is a leading digital media source of news and content for C-level executives across the world. Exec Digital presents the latest trends in business and lifestyle. It focuses on business and industry-specific issues such as: Leadership; Technology; Professional Services; and Strategy. Exec Digital is the industry-dedicated arm of the White Digital Media Group. Founded in 2007 by entrepreneur Glen White, White Digital Media retains a diversified portfolio of websites, magazines, daily news feeds and weekly e-newsletters that leverage technology to innovatively deliver high-quality content, analytical data, and industry news. Exec Digital is headquartered in Norwich, UK, with additional offices in Boston, Toronto, Mumbai, and San Diego, USA. For more information, contact +44 01603 217553 or visit http://www.execdigital.com.